This easy Vegan Slow Cooker Black-Eyed Peas recipe can be made in a slow cooker or on the stove-top and customized with your favorite seasonings and spices for a healthy vegan and gluten-free meal that’s freezer-friendly too! 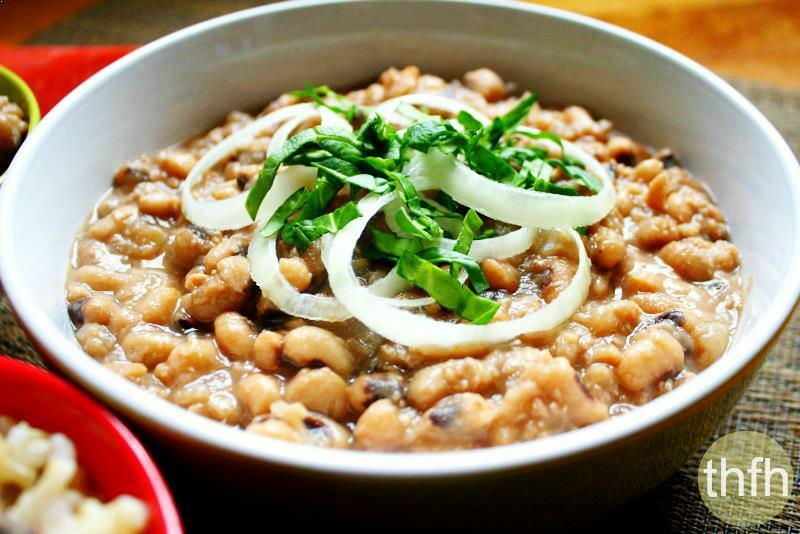 This simple and easy Clean Eating Vegan Slow Cooker Black Eyed Peas recipe uses only 3 basic ingredients, is made in a slow cooker or crock-pot, and can be made in a double batch so you can freeze the leftovers to have quick meal for another day. In my family growing up, it’s been a tradition to have a New Year’s Day dinner with black eyed peas and cabbage to bring in the New Year. The story was the black eyed peas “would bring you good luck” and the cabbage “would bring you money/good fortune” in the upcoming year. Every year since I was a child, my parents would make black eyed peas and cabbage on New Years Day and I faithfully ate my share hoping for good luck and fortune. The cabbage dish never really stuck with me, but the black eyed peas recipe did and I continue to enjoy it after all these years. This recipe is the one my mother makes every year and that I grew up with. Now that I’m a mother, it’s the same one I make for my family. There’s so many different ways to make black eyed peas and there’s really no right or wrong way to make them – it just comes down to personal preference. I like my black eyed peas to be soft and have a “mushy” consistency with a thicker, creamy-type gravy to them. 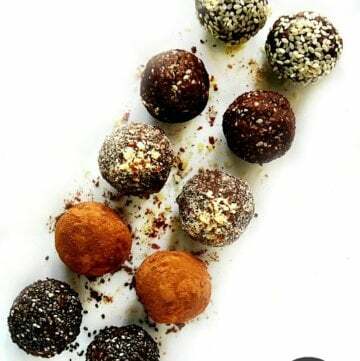 So if that’s how you like yours, then this recipe is just for you! Are Black Eyed Peas Vegan? Typically, black eyed peas are not vegan because they are made with bacon, pork, ham, sausage and even chicken stock. 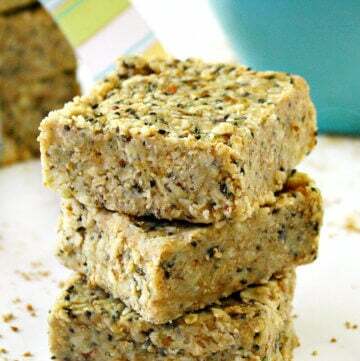 But in this recipe, no meat or animal products are used so this is a 100% vegan recipe! Do You Have To Soak Black Eyed Peas? If you are using dried black eyed peas, it’s best to soak them in advance. Even though you may read that soaking black eyed peas is not necessary, I prefer to soak them overnight to enhance digestibility and increase nutrient absorption. Simply place them in a large pot or bowl of water and make sure you have about 3-4 inches of water over the top of the peas because they will soak up most of the water. I like to soak mine overnight so they are ready to cook the next day. All you need to do the next morning is drain and rinse them and they’re ready to cook! How Long Should You Cook Black Eyed Peas In A Slow Cooker? Not counting the soaking time, it will take approximately 6-12 hours for them to cook to the “mushy” consistency in the photos. I set my slow cooker timer on HIGH (6 hours) once, check them, then set it a 2nd time on HIGH (6 hours) for a total of 12 hours cooking time. You may need to adjust the cooking time and setting depending on the type of slow cooker you are using. After the initial 6 hours, just keep checking them periodically until they are cooked the way you like, especially if you don’t like them in a “mushy” consistency. How Long Should You Cook Black Eyed Peas On The Stove Top? The length of time to cook black eyed peas on the stove top will depend on whether you soaked them in advance. Option 1: If you have soaked the peas: Add the black eye peas to a large pot with 1–2 inches of water covering the peas. Cook on medium heat (slow boil) for approximately 1 hour checking on them periodically, stirring and adding more water if needed. They will be ready when the beans are soft. Check the taste and adjust the seasonings to your preference. Option 2: If you didn’t soak the peas: Add the black eye peas to a large pot with 2–3 inches of water covering the peas. Cook on medium heat (slow boil) for approximately 2 hours checking on them periodically, stirring and adding more water if needed. They will be ready when the beans are soft. Check the taste and adjust the seasonings to your preference. Can You Freeze Black Eyed Peas? 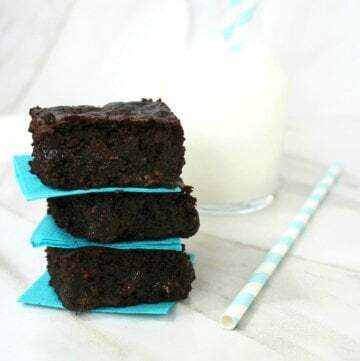 One of the reasons I love to make this recipe is because it’s freezer-friendly. If you like to meal prep, you can make this recipe on a weekend and freeze it for a quick meal during the week. 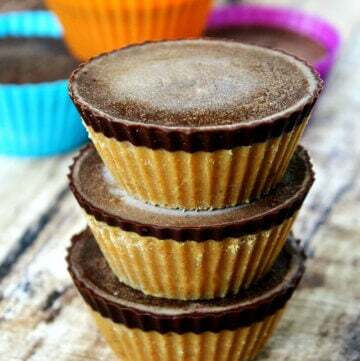 Since this recipe makes a double-batch, you can freeze the entire recipe or left-overs in an air-tight BPA-free containers for a quick meal when you’re short on time. If you don’t need a double-batch, just divide all the ingredients in half. Also, I used a large-size slow cooker so if you will be using a smaller crock-pot or slow cooker, you may have to make a single batch so it will all fit. Even with the large crock-pot, mine was filled almost to the top, but everything cooked well and I was able to stir it periodically without any trouble. Can I Customize This Vegan Black Eyed Peas Recipe? This is a BASIC black eye pea recipe which is perfect to start with because everyone has different tastes and preferences so you can use this base recipe and add whatever you like! 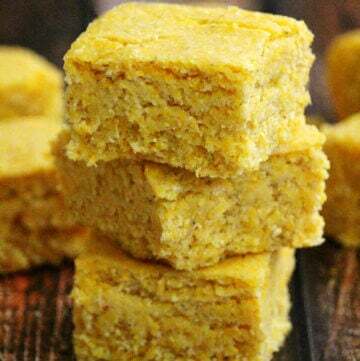 I like to serve my black eyed peas over fresh, steaming hot brown rice and you can even round it out with some warm, fluffy Vegan Cornbread for the perfect vegan meal! Black eyed peas are super nutritious and are an excellent source of vegan protein, fiber and iron. I buy my organic dried black eyed peas from the bulk section at Whole Foods, but if you don’t have access to a Whole Foods, you can buy black eyed peas online from Amazon. 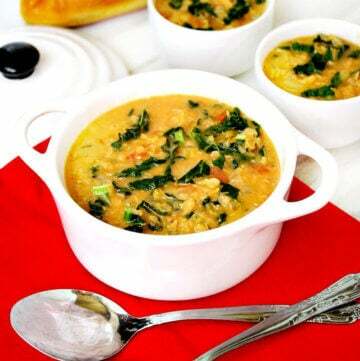 Want More Healthy Vegan Dinner and Soup Recipes? 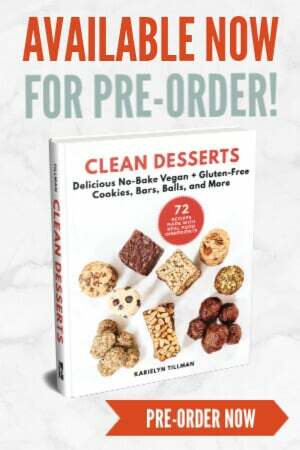 My Clean Eating Cookbook with more healthy, clean eating recipes just like this one that you will love! 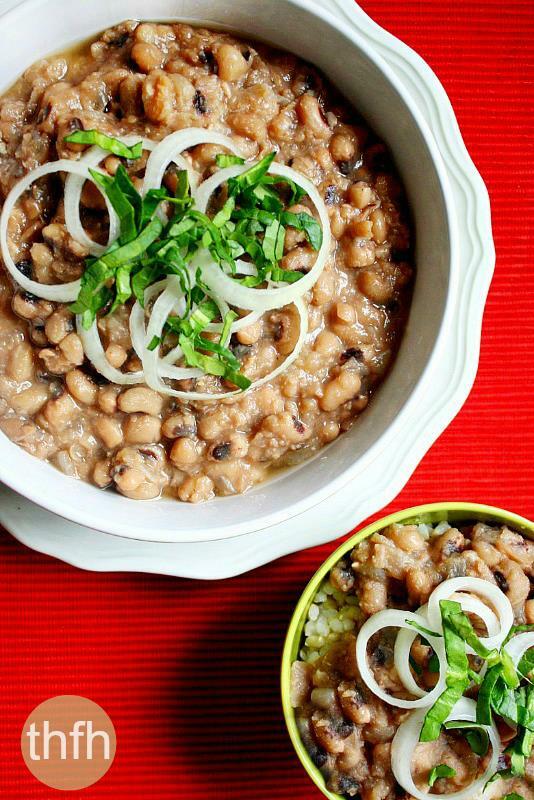 How Do You Make Vegan Slow Cooker Black Eyed Peas? Soak your black eyed peas. It’s not 100% mandatory to soak them, but I prefer to soak mine before overnight in a pot of water before cooking them. I then rinse and drain them before adding them to my slow cooker. Prep your veggies. You’ll need to get your veggies ready to add in by dicing the onions and any others that you’ll be adding (like jalapenos, carrots, cabbage, etc.). Cook! Get your slow cooker or crock pot ready, add everything it and set it to cook. Don’t forget to stir it periodically, add more water if necessary and adjust the seasonings (especially if you add extra water). That’s it! This is a super easy meal that I hope you will enjoy as much as I do! Tip #1: Don’t forget…this is just the basic recipe to get you started, but it won’t have much flavor unless you add your favorite seasonings to it. 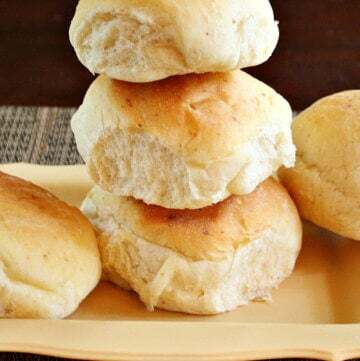 I’m sharing the basic recipe so you can customize it since there is so much variation and everyone has difference preferences. Some ideas are diced jalapenos, garlic, green onions, shallots, diced carrots, bay leaves, hot sauce, black pepper or even cayenne pepper. Tip #2: During the first hour of cooking (and before adding the onions and salt), use a large spoon and try your best to remove the white, bubbly foam that rises to the top. After about an hour or so of cooking and doing this, you can then add the onions and salt. I used to add all the ingredients in at the beginning (before doing this step) and it was hard to avoid scooping out some of the onions and seasoned gravy. Tip #3: I know that the whole idea of a cooking in a slow cooker is to put everything in there and forget about until it’s ready and it seems like there is a lot of stirring and checking on it as it cooks. I happened to be able to check on mine throughout the day and stir it periodically. If you set the timer on HIGH (6 hours) and leave the black eyed peas unattended (while at work, etc.) they should be fine. Just make sure you adjust the seasonings and stir well prior to serving. Tip #4: If you like a little gravy with your black eyed peas, add a little extra water to them as they cook. Just remember, that if you add extra water, you will need to adjust your seasonings (salt, pepper, etc). Step 1 Prepare the black-eye peas by soaking them in purified/filtered water overnight in a large pot or extra-large bowl with enough water to cover them + 2 - 3 inches. Rinse them well with purified/filtered water before adding to the slow cooker. 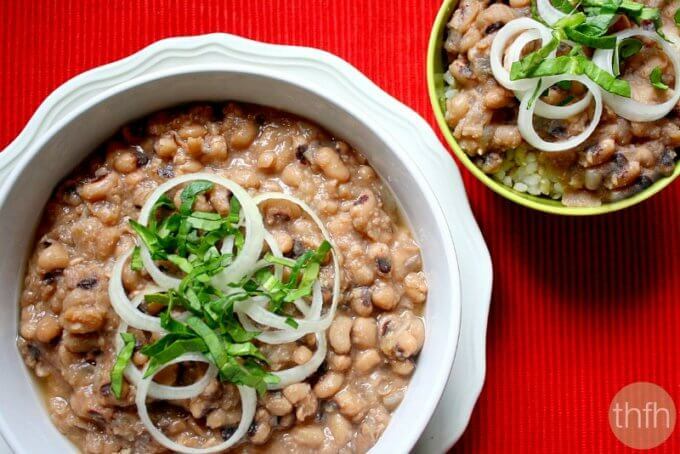 Put the soaked black-eye peas and 12 cups of water in the slow cooker and set the timer on "high/6 hours". After about 1 hour, use a large spoon to remove the white, bubbly foam that rises to the top. Add the diced onions, bay leaves, garlic, jalapenos, Himalayan pink salt, pepper and/or any other seasonings you'd like. Stir well, and continue cooking for the remaining 5 hours, stirring periodically. Check the peas after the first 6 hours to see if they are the texture you like and the gravy is the consistency you're looking for. If not, set the timer on "high/6 hours" for an additional 6 hours, checking each hour until they are how you like them, add additional water if needed. Serve over hot brown rice. You can freeze any leftovers for another meal. This recipe will make approximately 6 - 8 servings. 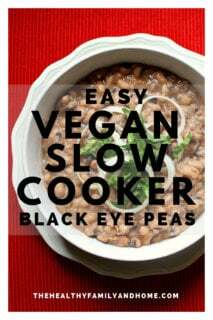 The recipe and photographs for "Vegan Slow Cooker Black Eye Peas" by Karielyn Tillman of The Healthy Family and Home are licensed under a Creative Commons Attribution-NonCommercial 4.0 International License and cannot be used without my written permission. Enjoyable thing, how you have done it?! It’s a party a party of my tastes! 🙂 When I first tried in Redmond 4500 multicooker I didn’t believe that it is so fast and have so nice view. I learned how to make black eye peas from my parents (it’s a New Year’s Day dinner tradition in our family) but I eventually started making mine in the slow cooker. I just called my father because I couldn’t remember how I used to make them on the stove and he refreshed my memory. Option 1: If you have soaked the beans: put them in a large pot with 1 1/2 – 2 inches of water covering the beans. Cook on medium heat (slow boil) for approximately 1 hour checking on them periodically, stirring and adding more water if needed. They will be ready when the beans are soft. Option 2: If you didn’t soak the beans: put them in a large pot with 2 – 3 inches of water covering the beans. Cook on medium heat (slow boil) for approximately 2 hours checking on them periodically, stirring and adding more water if needed. They will be ready when the beans are soft. Since you already soaked your beans, you won’t need as much water or to cook them as long so you can just go with the directions for option 1. For both options though, you will need to season them to your preference (my recipe is just a basic recipe, you will need to add extra spices, onions, bay leaves, garlic, carrots, jalapenos, pepper, etc.) Also, add a little more water as you check on them, if needed. I like mine a little mushy but if you like yours with a little gravy, just add a little more water to them as they cook. Black-eye peas don’t really take as long to make on the stove so you should be fine for dinner. Just popped it all in the crockpot….on the menu for tomorrow! 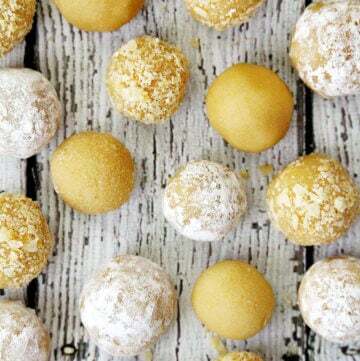 this recipe slays it! i cut the recipe in half and added a bay leaf and about 3 cloves of minced garlic and followed the recipe to a tee. i love how the peas break down a bit during the slow cooking process. i just used them as a replacement for pinto beans in isa chandra moskowitz’s recipe for chorizo sausages in the vegan brunch cookbook. over the top good! also excellent over sprouted short-grain brown rice with lightly fried jalepeno peppers on top. Hi Bee! I’m so glad you liked it! Oh wow…I am definitely going to have to make it again with the sprouted brown rice and jalapeno peppers…great idea!